On 25th July, 2001, Sri V. Vijayakumar of Morkulangara, Changanacherry town, Kottayam District, Kerala State, informed CESS that the region had received red colored precipitation in the morning. As per his report, the colored rain water had been collected and preserved in several houses. Some people had used the water for different purposes and were worried whether this could harm human beings, animals or plants. Two scientists from CESS visited the town on 26th July and collected water samples. They also spoke to the local residents about their observations related to the incident. On 29th July, the same scientists went to Changanacherry again and did a survey to obtain further information from the residents on the sequence of events that preceded the red rain. A search for possible earlier occurrences of red rain the world over revealed only a handful of reports mostly from the late nineteenth to the early twentieth century. Where scientifically studied, the reason for the color was found to be suspended dust particles, dissolved salts or pollutants. The sources for these contaminants were variously attributed to Saharan dust, microorganisms of African and South American origin and meteoric dust. In an article on red rain, W.M. McAtee suggested that the color could be due to the presence of rapidly multiplying reddish algae and rotifers living in rainwater (Monthly Weather Review, 45, 217-224, 1917). The cause of red color in rainwater during a rainfall in 1880 was determined to be the presence of the alga Protococcus fluvialis (La Nature, Sept. 25, 1880). Chemical analysis of the composition of red rain that fell in Sicily in 1872 showed the presence of several organic and inorganic compounds, and was accompanied by meteoric dust. Similar conclusions had been drawn on the colored rain that fell in Naples, Italy in 1818. Ehrenberg estimated that 720,000 lbs. of matter fell during a single shower, on October 17, 1846, near Lyons, France; and that 1/8th of the fall - 90,000 lbs. - was composed of microscopic diatoms (Passat-staub und Blut-regen, 1847; and Amer. Journal of Science, II. xi. 372). Interestingly, he was able to find over three hundred species of organisms (mostly diatoms) which were not thought to be African. Fifteen were South American. And the origin of the dust was unknown. One shower at Cape Verdes was described by Charles Darwin, who estimated that it covered more than 1,600 miles. Furthermore, Darwin determined that the red rain reached a distance of 800 or 1,000 miles from the coast of Africa. James Dwight Dana, in his Manual of Geology (3rd. rev. ed., 1880, pp. 633-635), points out that, based on these figures, an area of more than a million square miles had been showered upon by this single red rain. Coloured rain has been reported in Kerala in earlier years also. An instance of coloured rain that took place in Changanacherry in the 1950s was ascribed to the dissolution in rainwater of nitric oxide produced by lightning (Bharathikutty Amma, personal communication). There have also been newspaper reports of colored rain in 1896 (Malayala Manorama, July 4, 1896) and in Perumbavoor about fifty years ago (Mathrubhumi, July 31, 2001, p4). In addition, a few persons we spoke to mentioned about red rain occurring in their childhood. It, therefore, appears that colored rainfall might have been taking place occasionally in the state, but might have gone largely unnoticed. At Changanacherry, it was observed that a reddish brown substance had settled at the bottom of the vessel in which the colored rainwater had been collected by Sri Vijayakumar. The sediment and part of the water were collected for further study. Samples of colored rainwater from the nearby houses also were collected in clean plastic bottles. Eventually, brown sediments settled down in all the samples leaving the water colorless. This indicated that the color of the water had been due to suspended material (Figure 1). Sri Vijayakumar, the other members in the family and several people from nearby houses were interviewed to obtain information on the occurrence. The people living in the area reported hearing an extremely loud thunder in the morning of July 25th. A few of them claimed to have seen a flash of light along with the sound. This was reported to have occurred around 5:30 am in a region stretching from the Morkulangara temple in Changanacherry to a point west of the Variam Pond close to the flooded paddy fields. All the people who were interviewed felt that the thunder came from above and some even said that they had felt as if the roof was going to fall on their heads. A few people outside this region also reported a loud thunder. From these reports, an approximate location of the source of the sound could be determined, and this fell within the region where red rain was observed. The red rain was reported to have occurred around 8:30 am by most of the people. They were also largely in agreement that there had been more or less continuous rainfall in the night. The samples of water were brought to CESS and filtered to separate the suspended material. The pH of the water was found to be around 7, which is the pH for normal rain water. The electrical conductivity of the rainwater showed the absence of any dissolved salts. The sediment was dried and observed under a microscope. It appeared like a reddish brown dust. Based on these results, an initial conclusion was drawn that the loud thunder heard could have been due to a meteor and that the color in the rainwater was caused by dust from the meteor, since thundershowers are quite unusual during this monsoon period. The separated sediment weighed about 0.90 mg, which was given for detailed elemental analysis using the Ion Coupled Plasma Mass Spectrometer (ICPMS) technique (for elements other than carbon and silicon, which were done using Atomic Absorption Spectrometry and wet chemical methods, respectively) to determine whether the material is of meteoric origin. The results of the analysis (Appendix 1) shows that the material is not of meteoric origin. The composition does not correspond to that of volcanic or desert dust. Subsequently, further samples were obtained from Changanacherry, Valanchuzhy (Pathanamthitta District), and Meenachil (Kottayam District). 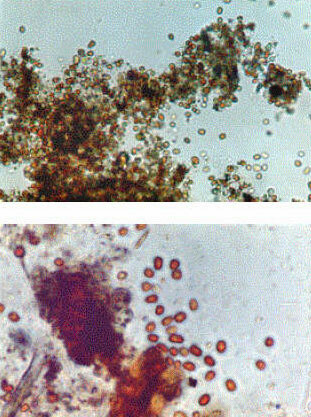 When these samples were observed under a microscope, it was found that they contained tiny round red coloured structures, which appeared to be spores of some micro-organisms. The sample was, therefore, handed over to the Tropical Botanic Garden and Research Institute (TBGRI) for microbiological studies. The samples were observed under a biological microscope. Fungal and algal spores, along with a few protozoans and other debris were observed. About 90 % of the spores were of algal origin (Figure 2). 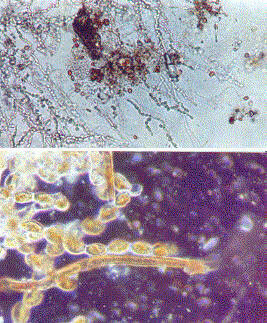 In order to identify the organisms, the spores were allowed to grow in a medium suitable for growth of algae and fungi. Small quantities of the sediments were inoculated to culture media such as Sabouraud’s agar (glucose - 40 g, peptone - 10 g, agar 20 g, distilled water up to 1 liter, pH - 5.5) and Czapek Dox agar (Preparation: solution A: NaNO3 - 40 g, KCl - 10 g, MgSO4(7H2O) - 10 g, FeSO4 - 0.2 g, dissolved in 1 liter of distilled water; solution B: K2HPO4 - 20 g dissolved in 1 liter of distilled water. Mix 50 ml of solution A and 50 ml of solution B and make it up to 1 liter. Add sucrose 30 g, agar 20 g, and 2 ml of trace elements). It was also inoculated to potato Dextrose agar (potato - 200 g, dextrose - 20 g, agar - 10 g, distilled water - 1 liter, pH - 5.5) to verify whether any pathogenic organisms are present. The debris was allowed to grow in Corn-meal agar (Preparation: corn meal - 30 g, agar - 20 g, distilled water - 1 liter. Blend corn meal in 800 ml distilled water, heat up to 60° C for one hour and make up the volume). The inoculated petri dishes and conical flasks were incubated for three to seven days and the culture was observed under the microscope. Intense growth was observed in the plates and the conical flasks with corn meal agar. Only poor growth was observed in the other media. 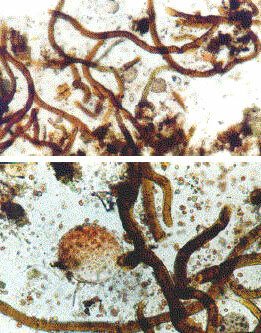 Special sporangia were also observed under the microscope (Figure 3). Intense growth seen in corn meal agar. The organism was identified as an alga belonging to the genus Trentepohlia, a lichen-forming alga. A lichen is not a single organism, but the result of a partnership (mutualistic/symbiosis) between a fungus and an alga or cyanobacteria. Some lichens are formed of three or more partners. The body of a lichen consists of fungal filaments (hyphae), surrounding cells of green algae and/or blue-green cyanobacteria. The lichen fungi (kingdom Fungi) cultivate partners that manufacture food by photosynthesis. Able to shut down metabolically during periods of unfavorable conditions, they can survive extremes of heat, cold, and drought. They are pioneers on bare rock, desert sand, cleared soil, dead wood, animal bones, rusty metal, and living bark. Most lichens grow slowly, probably because they live in environments where water is available for only short periods. Lichens have a truly remarkable resistance to drought. A dry lichen can quickly absorb water 3 to 35 times its own weight! Lichens can also absorb moisture from dew or fog, even from the air itself if the humidity is very high and the temperature is low. They also dry out slowly, making it possible for the photosynthesising partner(s) to make food as long as possible. This ability to quickly absorb and retain water from many sources makes it possible for lichens to live in harsh environments like deserts and polar regions, and on exposed surfaces like bare rocks, roofs and tree branches. 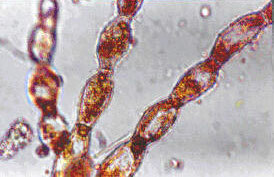 The thallus of Trentepohlia is filamentous and branched. The colour of the plant mass is typically brownish to yellowish red. This characteristic color is due to the presence of orange red haematochrome dissolved in fat globules of diverse size. In shaded conditions, the color may become dark and may also appear as given. This pigment is regarded as the food reserve which accumulates in the cells. In dry periods with cessation of growth, the pigment accumulates in large quantities. Vegetative reproduction is by detached wind-borne fragments. The cells readily separate from one another forming a fine dust which is dispersed by wind. Abundant reproduction occurs in wet weather. Sessile sporangia with swarmers are also produced. These swarmers may be biflagellate. In some species, the color may change fromorange-yellow to green. 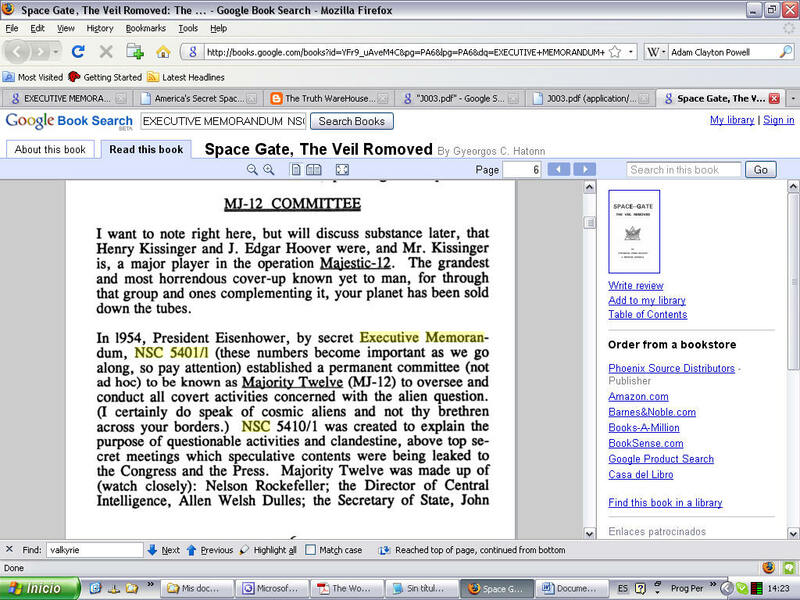 The site was again visited on August 16, 2001. It was found that almost all the trees, rocks and even lamp posts in the region were full of lichens. Samples were collected from the area and brought to the laboratory for detailed studies. These lichens are of fibrous type. Samples were observed under the microscope and confirmed the identity as Trentepohlia with orange-red pigment, haematochromes, inside the cells (Figure 4). The samples were again inoculated in media, as described earlier. They were observed under the microscope after five days. It was therefore concluded that the algal spores found in the colored rainwater from Changanacherry were of local origin. Branched filamentous thallus of Trente[ohlia observed in the cultures. The colored rainwater samples collected from Changanacherry were studied. The color was found to be due to the presence of a large amount of spores of a lichen-forming alga belonging to the genus Trentepohlia. Field verification showed that the region had plenty of lichens. Samples of lichen taken from Changanacherry, when cultured in an algal medium, also showed the presence of the same species of algae. Both samples (from rainwater and from trees) produced the same kind of algae, indicating that the spores seen in the rainwater could most probably have come from local sources. Colored rain has later been reported from a large number of places in Kerala. Samples were obtained from Valanchuzhy (Pathanamthitta Dt. ), and Meenachil, Elikkulam and Ettumanoor (Kottayam Dt.) When observed under the microscope, these samples also showed the presence of microorganisms similar to those found in the sample from Changanacherry. While detailed studies have not been conducted in these cases, it is highly probable that the microorganisms found in these cases also are lichen-forming algal spores from local sources. In all probability, the instances of colored rain reported from other parts of the state also might be due to such causes. The color may change according to the nature of the alga since the pigment varies in different algae. What are the reasons for the colored rain reported to have occurred this year only? Why has it been reported only from a few scattered places in the midlands of Kerala? And what is the mechanism by which a large number of spores go up into the air simultaneously? Two conditions are to be satisfied for this phenomenon to take place. First of all, there must be sufficient spores available. Secondly, they must be transported into the atmosphere more or less simultaneously and in large quantity so that, as they are washed down by rain, the water becomes colored. For sufficient spores to be available the area must have plenty of lichens and the weather conditions should be suitable. The entire area being thickly vegetated, gives ideal space for lichen growth on barks of trees, rooftops, walls and even on the ground. Further, culturing of samples of lichen taken from Changanacherry indicates that they are similar to the ones obtained through culturing the spores from the rainwater. It can, therefore, be reasonably concluded that the spores found in the rainwater originated locally. Lichens grow well in cold, humid conditions. Their life cycle has two phases, vegetative and reproductive. While the organism grows and spreads during the vegetative phase, spores are formed and disbursed during the reproductive phase. However, the organism can get into a reproductive phase if it perceives a threat to its existence in the form of adverse weather conditions or other physical parameters. A large number of spores can be produced quickly in such circumstances. Kerala has received almost continuous rainfall from March onwards this year, which does not happen normally. Conditions have thus been quite conducive for the growth of lichens. This is perhaps one of the reasons for the widespread presence of lichen seen in Changanacherry. The extent of lichen in the region is sufficient to generate the quantity of spores seen in the rainwater. For these lichen to release their spores simultaneously, it is necessary for them to enter their reproductive phase at about the same time. While this may be a possibility, it is quite improbable. Each individual organism would have its own life cycle, and it is difficult for all such organisms in a region to mature at the same time. A type of behavior known as synchronous flowering, where most of the plants of the same species produce flowers at the same time, is known in higher plants. Similar phenomena in algae, known as algal blooms, are also reported from eutrophic water bodies. However, such behavior has not been reported in lichens, but cannot be ruled out. An alternative possibility is that some microclimatic change could have stimulated the lichen. This might happen if there was bright sunshine of sufficient duration. The fact that colored rain has occurred in small pockets rather than over a large region indicates the possibility of some microclimatic change stimulating the release of spores. Unfortunately, microclimate data is not available to confirm this hypothesis. A detailed study of the behavior of lichen in different microclimatic conditions is therefore necessary to understand the phenomenon better. The people interviewed in Changanacherry reported hearing an extremely loud thunder early in the morning a few hours before the red rain. A few of them also mentioned seeing a light, which they interpreted as light from a lightning bolt. This happened on July 25th, when the state is in the middle of the south-west monsoon. Thunderstorms do not form during this time of the year, especially when the monsoon is in full swing. Further, thunderstorms do not begin and end with one single lightning stroke. The only other possibility for such a loud sound to be produced is from some object travelling at supersonic speeds. One explanation for the sound and the flash is that a meteor had passed overhead. The sound could have been the sonic boom produced by the meteor, which would have been burning brightly, thus giving out intense light also. The area where people in Changanacherry observed the red rain coincides well with the area where people reported the loud ‘thunder’. While a relationship between the two phenomena is not apparent, it is intriguing that red rain should occur in the same region a few hours after the sonic boom. There are no confirmed reports about thunder-like sounds from other sites where colored rain has occurred. 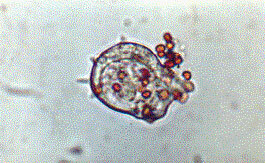 The lichen forming algal spores are microscopic and range in size from 3 to 5 micrometers. The normal mechanism of transport of spores into the atmosphere is by wind. In dry conditions, the spores can be easily carried by wind. Vertical circulation is needed to lift the spores to cloud heights. Such circulation is not normally present during night time. Since the colored rain was observed in the morning, the spores could have been released only some time in the night or early in the morning. Several people interviewed said that there had been rain in the night. In the circumstances, it appears that the spores could have entered the atmosphere early in the morning only. It is normally not possible for vertical winds to be present at these times. One possibility is that the spores released from trees remained in the air at the same altitudes and were washed down by the rain. This appears to be the only feasible mechanism. Detailed microclimatic studies are required to confirm this hypothesis. The lowland of Kerala is poor in permanent vegetation to support the growth of lichens. However, the midlands, especially the homesteads, and the highlands are thickly vegetated with perennial trees. These areas are thickly populated and hence the vegetation does not undergo periodic changes. In such conditions, spores, pollen grains and other organic debris may normally be present in rainwater, particularly during monsoon seasons. They can remain unnoticed if their numbers are not large enough to give color to the rainwater. Even when they are present in sufficiently large numbers, people may not notice the color if the rain occurs at night. During day time also, if someone notices the color in the rainwater collected in a vessel or tank kept outside, the natural inclination may be to think that some dirt has got into the vessel. During the discussions with the people in Changanacherry, one fact that came to light was that many people who saw colored water in vessels or buckets kept to collect rainwater just threw out the water and collected fresh water. Anyone could have felt that some unknown phenomenon had occurred. In some other areas, people said that they reported the colored rain only because it had become an item in the news. This points to the possibility that earlier occurrence of colored rain might have gone unnoticed and unreported. It is also possible that such lichens are present in the highlands and colored rain may be a frequent phenomenon there as well. Strange happenings have been reported from various parts of the state, like the collapse of wells, sudden lowering or disappearance of water from wells, and the sounds heard from wells (Mathai, J. and Singh, H.N. : Collapse of Open Wells and Other Related Phenomena in Kerala, Tech. Rep. No. PR - 62/2001, CESS, Thiruvananthapuram). One question that has been in the minds of people is whether these phenomenon are related to colored rainfall. Here two possibilities have to be considered. One is a direct cause-effect relationship between these phenomena. The second is the possibility of a common cause. The present understanding of the two phenomena cannot give a reasonable mechanism for either of them. The data on the occurrences of colored rainfall and well collapses do not support any relationship. For instance, the first well collapse was reported in June 2001, while the first report of colored rainfall appeared only in July 2001. Further, colored rainfall was reported from Lakshadweep where there was no well collapse. While the possibility of new insights leading to any link cannot be ruled out, at present it can be reasonably concluded that well collapses cannot directly cause colored rain. The possibility of a common cause leading to the two phenomena is difficult to explore unless the common cause can be identified. However, if such common cause is there, we may expect a reasonable degree of spatial and temporal agreement between reported cases of well collapse and colored rainfall. While the places from where these events have been reported fall more or less in the same region, there does not appear to be any temporal relationship. Therefore, the probability of these happenings being related is very small. However, one possibility is that well collapses are related to the unusual pattern of rainfall received by the state this year. As we have observed earlier, the growth of large amounts of lichen may be related to the weather pattern. 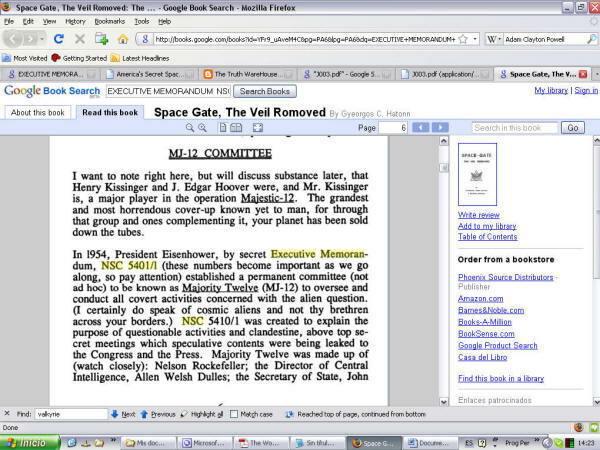 This is one possibility of a link between the two phenomena. Microclimatic and microbiological investigations at a few sites may be of help in understanding the phenomenon of coloured rain better. Although coloured rain may not occur every year, these investigations may help to understand the life cycle of lichens and their response to microclimatic stimuli, which can help in unraveling the phenomenon fully. We thank Mr. V. Vijayakumar, Gopurathinkal House, Morkulangara, Changanacherry, who first noticed this phenomenon, informed us and gave a water sample and the residents of Changanacherry who gave information on the events. We thank Dr. T. Radhakrishna, Dr. G.R. Ravindra Kumar, Sri G. Balasubramanian, Dr. P.P. Ouseph, Dr. M.N.M. Nair, Dr. Narendra Babu, Dr. D. Padmalal and Sri G. Madhusoodanan Pillai, Ms. B.S. Asha of CESS and Dr. P.B. Hosa Gowda, Dr. (Mrs.) Sarojini Menon and Sri S. Shiburaj of TBGRI for their help and suggestions. We thank the Director, CESS for many useful discussions and Director, TBGRI for support during the course of this study. This investigation was undertaken as a part of rainfall studies under a project sponsored by the Department of Science & Technology, Government of India.